Yes, this is the week of returns in the NHL, with Sidney Crosby playing against the Rangers on Thursday and all signs pointing to Alex Radulov returning to the Predators in the near future. And yet if you take a step back, what you’ve really got in the NHL right now is an epic race for the final playoff spots in the Western Conference. As of Wednesday morning, there were five teams separated by a single point in the standings for the final two playoff spots in the West. Notes: Phoenix has won three of four games against San Jose this year and plays them twice more. However, they also play St. Louis twice more, who they’re winless against. The Coyotes were excellent in February but have cooled slightly since. How they do on this next road trip (at Vancouver, Calgary, Edmonton and Dallas) could go a long way to sealing their playoff fate. Prediction: 6-3-3 in their final 12 games, to finish with 94 points. Notes: Of all the teams in the race, it’s the Sharks who have their fate in their own hands. They have six games against teams also fighting for the final two spots, including three against the rival Kings. Only one of San Jose or Los Angeles is making the playoffs, and it’s quite possible neither will make it. The Sharks have had a brutal 2012 thanks to some sour goaltending (although the team’s not scoring either). Can their much maligned core (Joe Thornton, Patrick Marleau in particular) save the season? The betting here is no, leading to an off-season of change. Prediction: 6-6-1 in their last 13 games, to finish with 91 points. Notes: Not only does Calgary have the easiest remaining schedule, but they have dominated the teams they will play against. The Flames have been scoring more goals per game over their last 20 games than any other team in the race, which bodes well. However, that awful shootout record could shoot them in the foot. Prediction: 6-4-2 in their last 12 games, to finish with 92 points. Notes: Not only will their games against San Jose go a long way to defining how the Kings finish, but their road record will as well. The Kings and Coyotes are the two strongest teams in this race on the road. The concern – as it has been all year – for Los Angeles has to be whether they will score enough to win games down the stretch. They’ve had a pedestrian last 20 games record-wise, scoring fewer goals during that stretch than any of their playoff race opponents. Prediction: 4-4-4 in their last 12 games, finishing with 90 points. Notes: The Avalanche clearly have the toughest schedule down the stretch, and have a terrible record against the teams they are to play. Having said that, they are one of the hottest teams in the NHL over their last 20 games, and their goals for and goals against have greatly improved in 2012. Like Los Angeles, Colorado’s destiny could be decided on the road, with seven more road games to play. Unfortunately for Avs fans, Colorado’s road record is only average. Prediction: 4-5-2 over their last 11 games, finishing with 88 points. 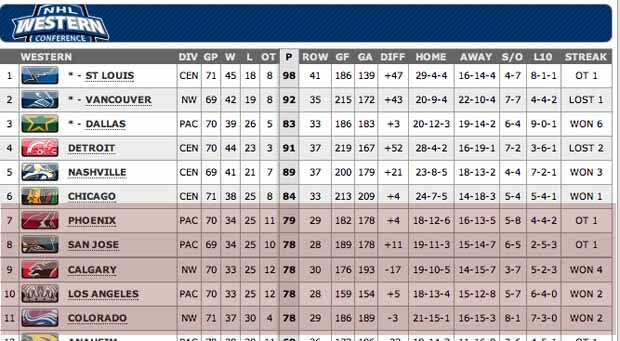 7th place: Phoenix Coyotes (94 points) – They’d likely play Vancouver in the first round. 8th place: Calgary Flames (92 points) – Momemtum + schedule = Feaster miracle. 9th place: San Jose Sharks (91 points) – And not a few weeks ago, I called them a contender. 10th place: Los Angeles Kings (90 points) – A lack of scoring probably costs Lombardi his job. 11th place: Colorado Avalanche (88 points) – A great stretch run brings optimism for 2012-13. Kudos to the Penguins for managing Sidney Crosby’s minutes and deciding to play him on the point on the powerplay. It will be fascinating to see how long this protection lasts, especially once the team gets to playoff time. Hard to see the Bruins or Rangers not trying to knock Crosby off the ice. Let’s not get ahead of ourselves regarding Alex Radulov. If KHL production is roughly 62% the equivalent of NHL production, then his Russian stats this season translate as follows: 26 goals, 39 assists over 82 NHL games. That’s not bad, but it’s not necessarily superstar worthy. You have to expect a learning curve as well going from the KHL to NHL stretch-drive/playoff action. Nonetheless, kudos to David Poile for pulling the wool over the eyes of other general managers. Make no mistake – the Predators are gunning for the Stanley Cup. Biggest reason why the Leafs are still in a freefall: It’s training camp all over again in Toronto. The team is learning to play Randy Carlyle’s structured style, which in many ways is the opposite to how they’ve played all year. It wouldn’t be a surprise to see the Leafs finish with a lottery pick. Speaking of the Leafs, Damien Cox’s tweet earlier in the week suggested that Toronto will try and target Jaroslav Halak in the off-season. Naturally, the question begs – why would St. Louis want to make that trade? How good has Steven Stamkos been? He’s the NHL’s leading goal-scorer currently by 12 goals. The biggest goal differential between the league’s top-two goal-scorers since the lockout was 13 goals in 2007-08 when Alex Ovechkin scored 65 and Ilya Kovalchuk had 52. Before that, it was a 14-goal differential in 1999-00 when Pavel Bure had 58 and Owen Nolan had 44. And prior to that, it was a 16-goal differential in 1991-92 between Brett Hull’s 70 goals and Kevin Stevens’ 54. Marty Turco has looked awful in two appearences with Boston. Their divisional lead over the Ottawa Senators is in serious jeopardy if Tim Thomas doesn’t play the bulk of Bruins games down the stretch.